Aquabase Ready For Use (R.F.U.) 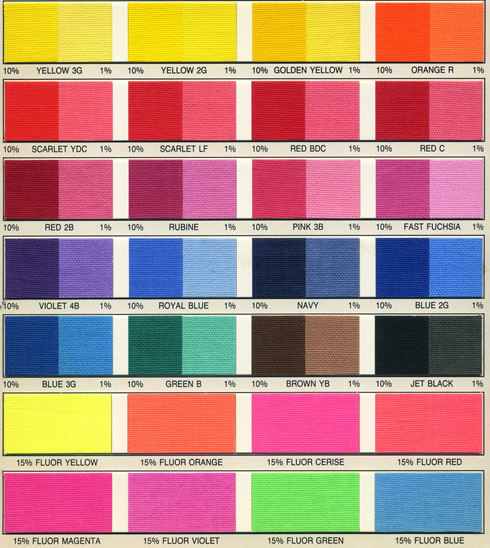 pigment dispersions are aqueous (water based) inks, widely used as textile inks (i.e. for screen printing), that requires no preparation or additives prior to use. Simply pour the ink from the container onto the screen, print, dry and heat cure. Under normal atmospheric conditions the Aquabase colors will print indefinitely without drying the screens. Flooded screens can be left standing for short period of time without the need to clean up. However, if long delays between printings are anticipated, the screens should be cleaned with plain or soapy water. Screen printing mesh sizes can be anywhere from 80 to 230 mesh or finer. Screens emulsions must be water and alkali resistant. Our aqueous textile inks are widely used in screen printing applications on T-shirts and other fashion garments. We at Spectrachem specialize in custom manufacturing of custom and specialty aqueous based textile inks and screen printing inks including short run orders and cost effective aqueous pigment dispersions made to your exacting requirements. Contact us with your requirements. 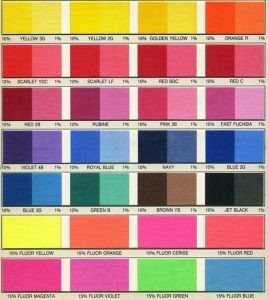 A full line of textile ink colors are available and can be intermixed to form an infinitive variety of shades. An Aquabase clear or reducer is also available and can used to lighten any color. The Aquabase RFU colors are supplied at an average viscosity which is satisfactory for most general printing. However, the printer has the option to adjust viscosity to their specific needs. This is done easily by adding water to reduce viscosity or adding Aquabase Thickener to increase viscosity. It is essential that the completed print is heat cured in order to maintain good wash fastness. The actual time and temperature required to dry and cure a print will vary with different heating equipment. Forced hot air systems usually work best. The print itself must reach a temperature of 275F. Spectrachem also offers Plastique High Solids – Ready For Use (RFU) water based ink that can be used as a screen printing ink or in roller printing applications and Plastisol inks that are also Ready For Use (RFU) PVC based ink products that are widely used in textile screen printing. Packaging: 1 Gallon, 5 Gallons and Drum containers.